In some cases, extremely high moment load capabilities are the primary application requirement. 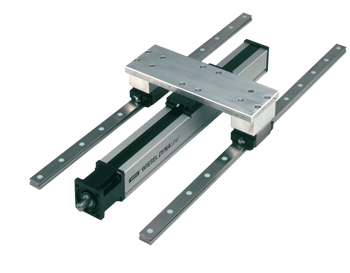 The DYNALine is an optimized version of the POWERLine (formerly Wiesel POWERLine) series of screw-driven rodless actuators designed to meet this demand by coupling the primary drive elements with external linear guides. This allows increased moment load capabilities to be realized, even at high speeds and long stroke lengths.